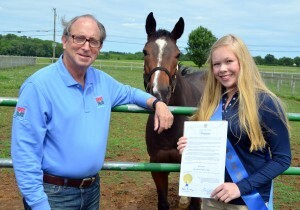 New Jersey Secretary of Agriculture Douglas H. Fisher and New Jersey Equestrian of the Year Kirsten Jeansson of Tabernacle kicked off June as the month of the horse in New Jersey with a visit to Hidden Acres 4-D Farm in Burlington County, a thoroughbred breeding facility on June 3. New Jersey is home to thousands of pleasure horses, show horses and racehorses. In 1977, to honor the important place horses play in New Jersey’s economy and quality of life, the horse was named the official state animal. To honor the state’s equine industry, Governor Chris Christie has proclaimed June the Month of the Horse in New Jersey. Kirsten Jeansson, a Seneca High School student, was named New Jersey Equestrian of the Year by the New Jersey Equine Advisory Board in January. Her duties include attending functions hosted by the New Jersey Equine Advisory Board and represent the Board at functions. At Hidden Acres 4-D Farm in Chesterfield and North Hanover, Secretary Fisher and Jeansson were given a tour and met the current mare, foal and yearlings in residence. The Wilkinson family has been involved in Thoroughbred horse breeding since 1979. The 222-acre preserved farm is now operated by Todd and Jennifer Wilkinson. They also have pleasure horses and a hay operation for feed. New Jersey has many top equine centers, facilities, and events. The Equine Science Center at Rutgers University, a valuable resource for everything equine in the garden state, is dedicated to better horse care through research and education. The United States Equestrian Foundation headquartered in Gladstone, funds programs that train and support top athletes and horses to compete at the Olympics, World Championships, Pan American Games and other top international competitions. The Horse Park of New Jersey at Stone Tavern in Allentown hosts the Jersey Fresh Three-Day Event, which has become one of the world’s top competitions. And, the Gloucester County Dream Park is a state-of-the-art equestrian complex created to provide opportunities for horse owners to participate in shows and competitions and for the public to experience horse events firsthand. For a calendar of Month of the Horse Events, visit www.jerseyequine.nj.gov.